Birth defects are the leading cause of death in the first year of life. Yet the future is brightening. Recent medical advances have enabled doctors to diagnose and treat some birth defects before birth, affording affected children a much greater chance at survival. Additionally, advances in our understanding of the causes of birth defects allow prospective parents to take steps to minimize the chance that an infant will be born with these types of disorders. 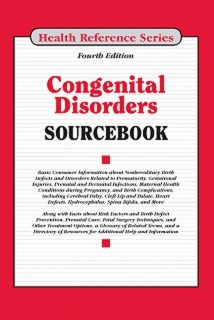 Congenital Disorders Sourcebook, Fourth Edition describes the most common types of nonhereditary birth defects and disorders related to prematurity, gestational injuries, prenatal and perinatal infections, maternal health conditions during pregnancy, and birth complications, including cerebral palsy, cleft lip and palate, fetal alcohol syndrome, spina bifida, and disorders of the heart, brain, gastrointestinal tract, musculoskeletal system, urinary tract, and reproductive organs. Causes, prevention strategies, and diagnostic tests are explained, and innovative treatment strategies, including fetal surgery, are described. The book concludes with a glossary of related terms and a directory of resources for further help and information. This book is divided into parts and chapters with parts focusing on broad areas of interest and chapters devoted to single topics within a part. Part I: Prenatal Concerns and Preventing Birth Defects describe what is known about the causes of birth defects and what can be done to prevent them. It details the most common risk factors for congenital disorders, including substance use, medications, environmental elements, and infectious diseases and other maternal health conditions with known adverse fetal effects. Disorders of the amniotic fluid, placenta, and umbilical cord are also discussed. Additionally, the part offers facts about other pregnancy complications that can affect fetal health, and it describes the steps that can be taken to help ensure a healthy pregnancy. Part II: Prematurity and Other Birth Complications provides basic information about the types of complications that can affect premature infants, including apnea of prematurity, persistent pulmonary distress syndrome, retinopathy of prematurity, and persistent pulmonary hypertension. It addresses the most common health concerns with twins and other multiple births, including twin reversed arterial perfusion sequence, unequal placental sharing, and twin-twin transfusion syndrome. It also describes the types of infections that can be passed from mother to infant at birth, explains the screening tests that are given to newborns, and details what parents can expect in labor and delivery and in the first days after birth when a baby has a health problem. Part III: Structural Abnormalities and Functional Impairments offers detailed information about the most common types of physical defects, including spina bifida, cerebral palsy, craniofacial and musculoskeletal defects, and defects of the brain, heart, kidney, liver, pancreas, reproductive organs, gastrointestinal tract, and urinary tract. It describes the causes and symptoms of each disorder, the diagnostic tests, and treatment techniques used with each, and the research advances that are improving prevention efforts and treatment outcomes. Part IV: Additional Help and Information includes a glossary of terms related to congenital disorders and a directory of resources offering additional help and support.